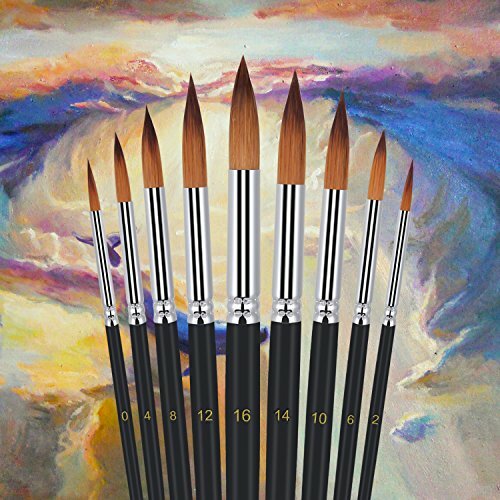 ♥ FLEXIBLE BRUSH HAIR with POINTED WATERCOLOR: This paintbrush set are made of professional acrylic, top-grade imported nylon wool, nickel plated copper tube and wood body. It is a well-made delicate painting brush set with solid and flexible hair, durable and washable. After testing, they are proved to be safe and harmless to the human body. ♥ FULL RANGE OF PAINT BRUSH SIZES & SHAPES. Small, medium and large thickness, as well as round, flat, filbert, angular and angle shapes with a razor sharp tip capable of complementing any palette. ♥ MULTIFUNCTION: As hobby paint brushes, kids paint brushes, or pro paint brushes, our products are perfect for any level or type of artists, from beginners to professionals. ♥ COMFORTABILITY: With wooden handle and fine workmanship, each brush is sturdy and durable. It gives you enough control of the brush and provides you with comfortable hand feeling for grabbing and painting. ♥ EASY TO CLEAN: Just run brushes under warm water, washing out the paint and gently use your fingers to reshape. If you have any questions about this product by foxmum, contact us by completing and submitting the form below. If you are looking for a specif part number, please include it with your message.